Mark Your Calendar. Write down important dates. This is especially important when you’re juggling the schedules of multiple children. Don’t be surprised by a choir concert or soccer banquet that you forgot about. Write down these dates as soon as possible and don’t forget to check your calendar periodically or else your preparation will go to waste. Buy Back-to-School Supplies Early. Shop for supplies as soon as your child get’s their list of required items. Also, make sure you fill their backpacks at least a few days before school starts to avoid the morning-of scramble to find their pencils, paper, etc. Some teachers, more than others, can be specific about the supplies required. Keep your receipts so that you can return items that you do not need. Re-Establish Bedtime and Mealtime Routines. Make plans to re-establish your bedtime and mealtime routines at least a week in advance of the first day of school. This will ease your child back into the school year routine. Emphasize to them the benefits of a steady routine, i.e. a good night’s sleep and time for a healthy breakfast before school. Freeze a Few Dinners That Are Easy to Make. Having a few quick and easy meals will prevent added stress on school nights and facilitate quality time spent around the dinner table as a family. Visit School With Your Children. If your child is young or beginning a new school, visiting the school together can help alleviate any anxieties your child may harbor as well as resolve any of your child’s questions. First day familiarity with his or her classroom, lunchroom, locker and teacher will be invaluable to your child. Call ahead to schedule a time to meet with your child’s teacher beforehand. Designate a Place for School Items (Backpacks, Lunchboxes, etc.) It may sound simple, but establishing a location in your home that your child habitually places their school items may prove crucial in those clutch moments when you’re pressed for time in the mornings. In the same location, have a spot where your child can place take home announcements from his or her teacher. Set Aside a Location for Your Child to Do Homework. If possible, older children should be allowed the opportunity to study in a quiet place in the house. Whereas younger children will need to work in area like the kitchen or family room so that they can be monitored and encouraged. Thank you reading. 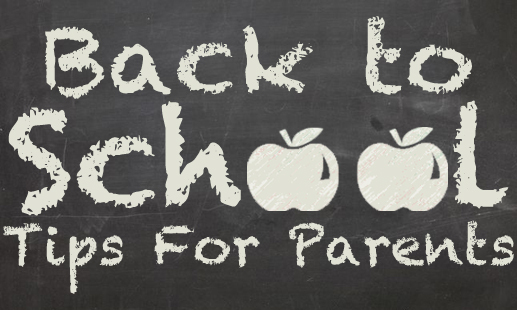 I truly hope these tips help you and your family this school year. For more helpful tips on a variety of school topics visit the NASPs website,www.nasponline.org/resources. KidzWorld Back-to-School FX – In the spirit of Back-to-School, I’d also like to take this opportunity to invite you to our Back-to-School FX event on August 22nd. If you’re tired of shelling out so much cash for a night of family fun, then we have what you’re looking for. Back-to-School FX will consist of live entertainment the whole family will enjoy and conclude with KidzWorld Watermark. On top of all the fun, KidzWorld FX is an excellent opportunity for families to learn about God’s Big Ideas together. Keep checking back here for more information, and enjoy the rest of your summer!